Coconut oil is all the rage now. People from ketogenic dieters to paleo enthusiasts to avid cross-fitters tout it as an energy-boosting, fat-fighting “superfood”. But are any of these claims supported by sound scientific research? Or are they just based on unsubstantiated hype? In this piece, we investigate all of the science to show how coconut oil affects your body and whether or not you should add it into your ketogenic diet. What really is Coconut Oil? Coconut oil is a fat composed entirely of molecules called triglycerides. These molecules consist of a 3- carbon molecule called glycerol attached to three chains consisting of carbon and hydrogen atoms called fatty acids. They typically come in one of three varieties. The first, called saturated fats, has no double bonds between any of the carbon atoms in the fatty acids. The second, called monounsaturated fats, has exactly one double bond between carbon atoms in at least one of the three carbon chains in the fatty acid molecule. The third, called polyunsaturated fats, has more than one double bond between carbon molecules in one or more of the three carbon chains in the fatty acid molecule. Because coconut oil is primarily composed of saturated fats, many people have demonized them as unhealthy while hailing fats high in monounsaturated and polyunsaturated fats such as olive oil as healthy. However, that assumption that all saturated fats are bad for your health has recently come under scrutiny. In 2014, researchers conducted a meta-analysis of 72 research studies including 27 randomized, controlled clinical trials examining the impact of saturated fats on cardiovascular health. Altogether the studies included over 650,000 subjects. After assessing the data, researchers found no significant association between the consumption of saturated fats and diseases of the heart and blood vessels including coronary heart disease, angina, and heart attack. Thus, they concluded that “current evidence does not clearly support cardiovascular guidelines that encourage high consumption of polyunsaturated fatty acids and low consumption of total saturated fats.”  Another meta-analysis of 21 observational studies that included almost 350,000 subjects also observed little association between cardiovascular diseases and the consumption of saturated fats. The authors concluded “that there is no significant evidence for concluding that dietary saturated fat is associated with an increased risk of CHD or CVD.”  Even Harvard Medical School, which has traditionally taken a conservative stance on nutrition research, has stated that relationship between saturated fat and heart disease is “muddled” and unclear. Furthermore, saturated fats can vary chemically and nutritionally. In butter, red meats, other mammal-based animal products, and saturated fats are primarily long chain triglycerides (LCTs) which are usually 13-21 carbon atoms in length. In contrast, about 70% of the triglycerides in coconut oil are medium chain triglycerides (MCTs) which are usually 6-12 carbon atoms in length. The most common MCT found in coconut oil is 12 carbons in length and is called lauric acid; it composed about 52% of the fats in coconut oil. Because of their smaller length, MCTs have different nutritional and biochemical properties than LCTs. They have about 10% few calories: LCTs yield 9.0 calories per grams while MCTs yield 8.3 calories per gram. After being digested, MCTs go straight from your small intestine to your liver where they are rapidly broken down to yield energy. Thus, MCTs can be more readily used by your body as energy than LCTs. It is important to note that LCTs are not always saturated. Soybean oil and safflower oil are examples of unsaturated LCTs. Because of coconut oil’s unique chemical composition of MCTs and the fact that it is the only vegetable-based saturated fat, scientists have been particularly curious to learn how it impacts human health. Below we look at research studies evaluating four unique ways that coconut oil may affect your weight, body fat, and overall health. Does Coconut Oil Increase Calorie Consumption? According to biochemistry, MCTs are more easily yield energy more readily than LCTs. However, what does this mean for your body? In a study from 1991, scientists sought to compare how many calories are burned after consuming a meal of LCTs and one of MCTs. To test this, they recruited twelve subjects: six obese but otherwise healthy men and six lean, healthy men. They provided all subjects with a mixed meal including 38 grams of LCTs and then a mixed meal including 30 grams of MCTs plus 8 grams of LCTs the following day. The dose of 30 g of MCTs and 8 g of LCTs was designed to imitate the ratio of saturated fats in coconut oil. The two meals were identical in calories and proportion of calories from fats, carbohydrates, and proteins. About six hours after each meal, the researchers measured the subjects’ postprandial thermogenesis (PPT), which is the energy used to carry out digestion. Other studies have shown similar findings. In one clinical trial on seven healthy men with an average age of 21, researchers provided subjects with 400 calories of MCT or LCT and monitored their postprandial oxygen consumption- a key indicator of energy expenditure- for six hours. 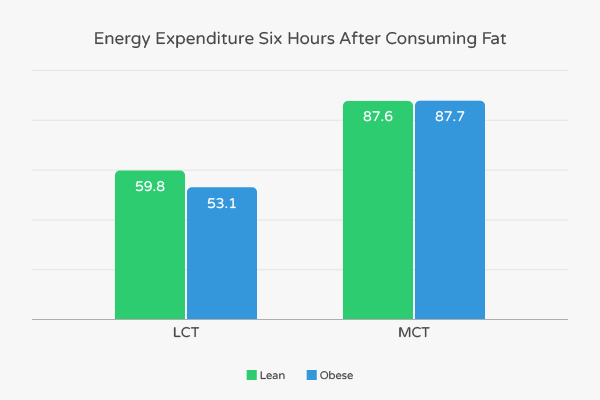 In another study from Geneva Switzerland, researchers provided eight young men with three meals in a 24 hour period consisting of a ratio of MCTs to LCTs. During the 24 hour period, the first group of two consumed 0 grams of MCTs and 30 grams of LCTs, the second group of two consumed 5 grams of MCTs and 25 grams of LCTs, the third group of two consumed 15 grams of MCTs and 15 grams of LCTs, and the fourth group consumed 30 grams of MCTs and 0 grams of LCTs. Key Takeaways: In both obese and lean male subjects, consuming MCTs found in coconut oil significantly increases basal expenditure as measured by postprandial thermogenesis and postprandial oxygen consumption. It is important to emphasize, though, that these studies had small sample sizes and provided subjects with MCTs (which are abundant in coconut oil) but not actual coconut oil. In addition to stimulating greater energy expenditure, the MCTs found in coconut oil can help reduce appetite- another notable benefit for people trying to lose weight. In a 14-day study, researchers provided six healthy male volunteers with an average age of 27 years with one of three diets: one with a low ratio of MCTs to LCTs, one with a medium ratio of MCTs to LCTs, and one with a high ratio of MCTs to LCTs. According to the authors, “the ratio of MCT to LCT was 1:2, 1:1 and 2:1 on the low-, (LMCT) medium- (MMCT) and high-MCT (HMCT) diets, respectively.”  All of the subjects consumed a fixed ratio of 62% calories from fats, 28% calories from carbohydrates and 10% calories from protein. However, they were free to consume whatever amount of food they wanted to. After the trial was done, researchers noted that caloric consumption was significantly lower in the high MCT group. 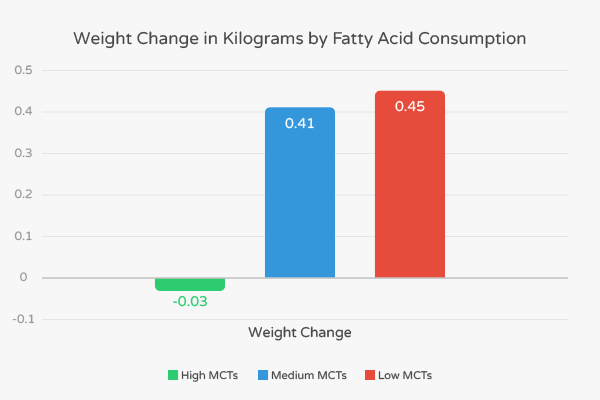 More specifically, the group that consumed a high ratio of MCTs to LCTs consumed 8% fewer calories than the group that consumed a low ratio of MCTs to LCTs. Additionally, the group that consumed a high amount of MCTs was the only group that experienced any weight loss during the 14 days. Thus, there is a reasonable amount of evidence to suggest that MCTs can help suppress hunger- at least when used instead of LCTs. Key Takeaways: Swapping out fats high in LCTs, such as safflower and soybean oil, for fats high in MCTs such as coconut oil may suppress hunger and ultimately lead to greater weight-loss. However, virgin coconut oil and other foods high in MCTs need to be assessed more rigorously against other weight-loss tools, such as eating greater dietary fiber, to better understand its effectiveness. 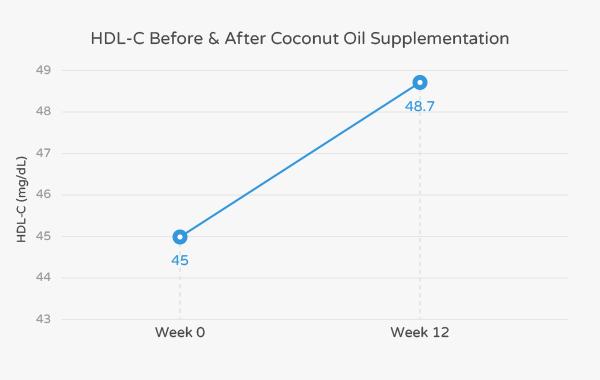 So, how does consuming coconut oil affect HDL-C and LDL-C? In a double-blind, randomized clinical trial with 40 women ages 20-40, researchers divided the subjects into two groups and provided them with 30 mL daily doses of supplements for 12 weeks. The first group of 20 consumed a daily dose of 30 mL of soybean oil while the second group of 20 consumed 30 mL of a coconut oil supplement per day. All 40 women were asked to eat a balanced, low-calorie diet and walk for about 50 minutes each day. Finally, an observational study examining the effect of coconut oil in 1,839 Filipino women ages 35-69 years concluded that “dietary coconut oil intake was positively associated with HDL-C levels.”  Thus, a reasonable amount of research indicates that consuming coconut oil and MCTs can increase levels of HDL cholesterol. Key Takeaways: Several high-quality, randomized controlled trials indicate that consuming coconut oil instead of foods and oils high in LCTs may increase heart-healthy HDL cholesterol and decrease LDL cholesterol. More research needs to be done to compare the effects of coconut oil with oils high in polyunsaturated fats such as olive oil. Does Coconut Oil Target Belly Fat? Doctors and dietitians agree that visceral fat, or the fat found in the stomach or waist, is particularly harmful to long-term health. Interestingly, some research suggests that consuming coconut oil can help you shed belly fat. In a six-week study from 2011, researchers examined the effects of coconut oil on weight-reduction in 20 obese Malaysian men. The subjects had an average age of 40.7 years and were all overweight (defined as having a BMI greater than 25). During the trial, they were asked to maintain their normal diet and consume 30 mL of coconut oil per day. 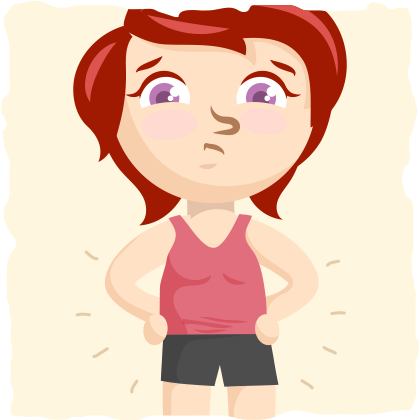 At the end of the six weeks, they noted that the average waist circumference decreased from 102.62 cm to 99.78 cm. This represents a 2.84 cm, approximately a little over an inch. While that may not seem like much, it is important to emphasize that the only change the participants in the study made was incorporating 30 mL of coconut to their diet. Thus, the authors concluded that “virgin coconut oil is efficacious in [waist-circumferance] reduction especially in males and is safe for us in human.”  The subjects also experienced another unexpected benefit: they had lower levels of creatinine which indicates lower levels of inflammation in the body. They concluded that “dietetic supplementation with coconut oil… seems to promote a reduction in abdominal obesity.” . Similarly, the two Chinese randomized clinical trials by Liu et. al and Zhang et. al also showed a notable reduction in waist circumference and abdominal fat after consuming coconut oil. Key Takeaways: Consuming a moderate amount (up to 30 mL) of coconut oil may reduce harmful abdominal fat. However, more rigorous trials need to be conducted to establish a stronger association. Given the reasonably strong research, how can you incorporate coconut oil into your diet? First, pick up a trusted brand of virgin, unprocessed coconut oil. You can find a set of trusted brands at this link from Evolving Wellness. Then, consider swapping out a tablespoon of butter, lard, or oil high in long-chain triglycerides such as soybean or peanut oil. Remember to bear in mind, though, that coconut oil has not been tested against healthful fats such as olive oil- though some research may indicate it may stimulate the highest resting energy expenditure. As you use coconut oil for a variety of recipes, remember to monitor key indices such as body fat, waist circumference, and HDL and LDL cholesterol to understand how coconut oil is affecting your body. This way you can use the research to make lifestyle changes and utilize data to see if coconut oil is the right choice for you. Katragadda, Harinageswara Rao, et al. “Emissions of volatile aldehydes from heated cooking oils.” Food Chemistry 120.1 (2010): 59-65. Chowdhury, Rajiv, et al. “Association of dietary, circulating, and supplement fatty acids with coronary risk: a systematic review and meta-analysis.” Annals of internal medicine 160.6 (2014): 398-406. Siri-Tarino, Patty W., et al. “Meta-analysis of prospective cohort studies evaluating the association of saturated fat with cardiovascular disease.” The American journal of clinical nutrition (2010): ajcn-27725. Ruppin, D. C., and W. R. J. Middleton. “Clinical use of medium chain triglycerides.” Drugs 20.3 (1980): 216-224. Scalfi, Luca, Alberto Coltorti, and Franco Contaldo. 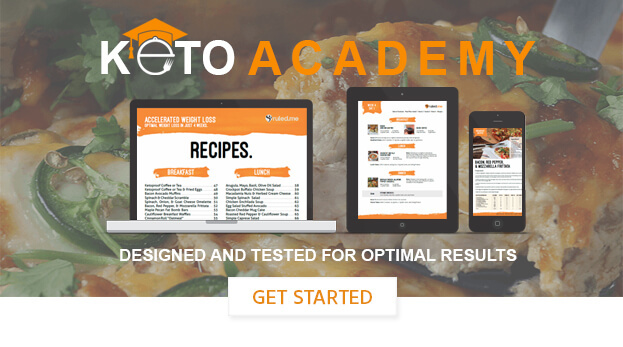 “Postprandial thermogenesis in lean and obese subjects after meals supplemented with medium-chain and long-chain triglycerides.” The American journal of clinical nutrition 53.5 (1991): 1130-1133. St-Onge, Marie-Pierre, and Peter JH Jones. “Physiological effects of medium-chain triglycerides: potential agents in the prevention of obesity.”The Journal of nutrition 132.3 (2002): 329-332. Gordon, Tavia, et al. “High density lipoprotein as a protective factor against coronary heart disease: the Framingham Study.” The American journal of medicine 62.5 (1977): 707-714. Brunzell, John D., et al. “Lipoprotein management in patients with cardiometabolic risk: consensus conference report from the American Diabetes Association and the American College of Cardiology Foundation.”Journal of the American College of Cardiology 51.15 (2008): 1512-1524. Campos, Hannia, et al. “Low density lipoprotein particle size and coronary artery disease.” Arteriosclerosis, thrombosis, and vascular biology 12.2 (1992): 187-195. Assunçao, Monica L., et al. “Effects of dietary coconut oil on the biochemical and anthropometric profiles of women presenting abdominal obesity.” Lipids44.7 (2009): 593-601. Liu, Yinghua, et al. “A good response to oil with medium-and long-chain fatty acids in body fat and blood lipid profiles of male hypertriglyceridemic subjects.” Asia Pacific journal of clinical nutrition 18.3 (2009): 351. Zhang, Yuehong, et al. “Medium-and long-chain triacylglycerols reduce body fat and blood triacylglycerols in hypertriacylglycerolemic, overweight but not obese, Chinese individuals.” Lipids 45.6 (2010): 501-510. Feranil, Alan B., et al. “Coconut oil predicts a beneficial lipid profile in pre-menopausal women in the Philippines.” Asia Pacific journal of clinical nutrition 20.2 (2011): 190. Hamdy, Osama, Sriurai Porramatikul, and Ebaa Al-Ozairi. “Metabolic obesity: the paradox between visceral and subcutaneous fat.” Current diabetes reviews 2.4 (2006): 367-373.